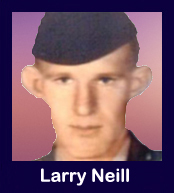 The 35th Infantry Regiment Association salutes our fallen brother, PFC Larry Wayne Neill, who died in the service of his country on February 2nd, 1969 in Pleiku Province, Vietnam. The cause of death was listed as Small Arms/AW. At the time of his death Larry was 20 years of age. He was from Lewisburg, Tennessee. The decorations earned by PFC Larry Wayne Neill include: the Combat Infantryman Badge, the Parachute Badge, the Bronze Star, the Purple Heart, the National Defense Service Medal, the Vietnam Service Medal, the Vietnam Campaign Medal and the Vietnam Cross of Gallantry with Palm Unit Citation. Larry had prior service with C, 1/35th. He was serving with the 75th Rangers at the time of his death. Taken from the website of the Shelbyville Times-Gazette, 5 February 2008. Larry Wayne Neill was a native of Bedford County, born April 2, 1948. He was the son of Vollie and Lettie Ella Neill. He graduated from Shelbyville Central High School. Prior to entering service he was employed by Heil-Quaker Corp. in Lewisburg. He entered the U.S. Army on Feb. 13, 1968. His tour of duty began on Aug. 21, 1968. He was a PFC-E3 with the U. S. Army Paratroopers, 4th Infantry Division.